All nine OCA vice-presidents were reappointed and Koji Murofushi, Japan's Athens 2004 Olympic hammer champion elected Chairman of Athletes Committee. Sheikh Ahmad Al-Fahad Al-Sabah has been re-elected by acclamation for a fresh four-year term as President of the Olympic Council of Asia here at the body's annual General Assembly. The Kuwaiti, who has served in the post since 1991, faced no opposition today and will now serve until at least 2019. Considered one of the key power-brokers in world sport, Sheikh Ahmad is a longstanding member of the International Olympic Committee (IOC) who also heads the Association of National Olympic Committees and was made a member of the FIFA Executive Committee earlier this year. Speaking afterwards, Sheikh Ahmad cited utilising technology and appealing to youth-groups as two particular objectives, promising how the 2022 Asian Games awarded to Hangzhou today will be a "smart" Games. "It is easy to leave the position, but to continue is [a] big responsibility," he said. "We have had a lot of successes in this organisation, but we always want more, we have to maintain and continue what we have achieved. He also cited maintaining the importance of continental events at a time when the continent is hosting a "hat-trick" of Olympic Games in Pyeongchang, Tokyo and Beijing. There were no elections for any of the other positions today, Sheikh Ahmad explained, as candidates had all agreed on presenting one name for each position available. All nine OCA vice-presidents were reappointed, while several new leaders were approved for the various committees. Hong Kong's Timothy Fok remains the representative for East Asia, while Kazakhstan's Temirkhan Dosmukhametov and Pakistan's Sayed Arif Hasan will represent Central and South Asia respectively. Charouck Ariachakran of Thailand continues to lead Southeast Asia while Sheikh Issa Bin Rashid Al-Khalifa of Bahrain keeps his position for West Asia. 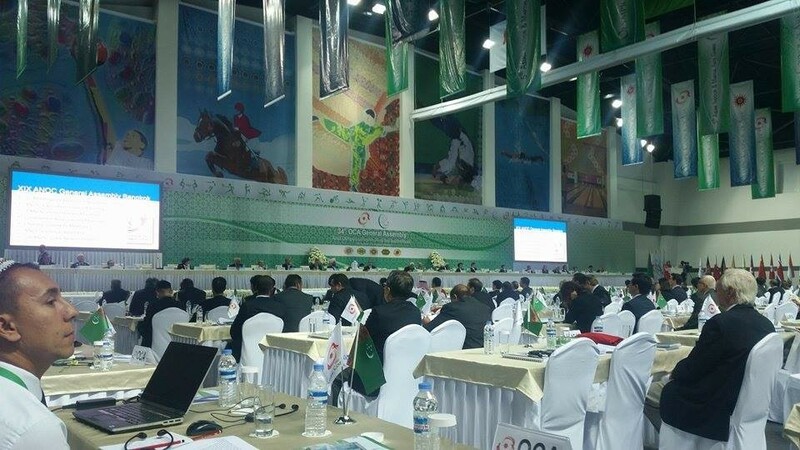 Four other vice-presidents represent Organising Committees for future events: Turkmenistan's Sapardurdy Toylyyev, Vietnam's Hoang Vinh Giang, Japan's Tsunekazu Takeda and Indonesia's Rita Subowu representing the 2017 Asian Indoor and Martial Arts Games, the 2016 Asian Beach Games, the 2017 Asian Winter Games and the 2018 Asian Games respectively. Among new appointees to the various OCA Commissions and Working Groups was Koji Murofushi, Japan's Athens 2004 Olympic hammer champion who is also sports director for the Tokyo 2020 Organising Committee. He succeeds compatriot Yuko Arakida as chair of the Athletes’ Committee, meaning he should also gain a spot on the ANOC Athletes' Commission chaired by New Zealand's Barbara Kendall. Among other roles, Song Luzeng replaced fellow Chinese official Zhang Jilong as head of the Sports Committee, while their compatriot Wei Jizhong was named head of the Ethics Committee.